Rising millennial population, higher spending on eating-out and increase in per capita food consumption in developing countries are the primary factors leading the global HoReCa drip coffee maker market during the forecast period. The market is also expected to continue being augmented by rising demand for fast food, domestic tourism and expanding young population. The global HoReCa drip coffee maker market is, however, currently restrained by the advent of new technologies and a shift towards pod coffee and capsule coffee consumption trends. Increasing competition among key players is the main challenge for HoReCa drip coffee maker manufacturers. As competition intensifies in the sector with price wars among leading players, industry players are expected to improve the efficiency of their value chain, from inbound logistics to distribution and, to a large extent, marketing and export of products. 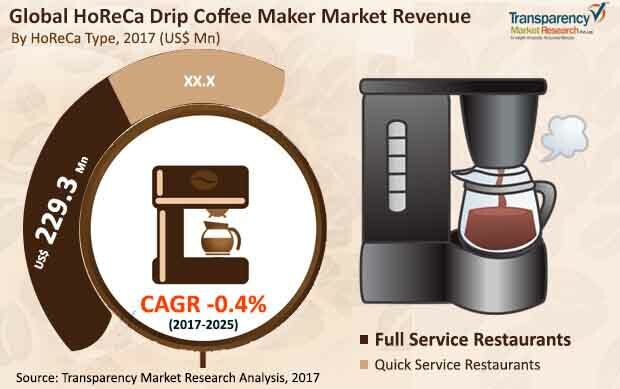 Revenue generated from HoReCa drip coffee maker market is estimated to be valued at roughly US$365.5 mn by the end of 2017 and is expected to decline at a CAGR of -0.4% over the forecast period. Global HoReCa drip coffee maker market are expected to be valued at approximately US$352.7 mn by the end of 2025. By HoReCa type, the drip coffee makers is segmented into quick service restaurants and the full service restaurants. Both the segments are likely to be declining in the forecast period due to the rising consumer preference towards pod coffee makers and the automatic drip coffee makers. The rising consumer tastes and preferences is further posing the market to decline in the forecasted period. Lack of time, especially in the quick service restaurants is expected to make the drip coffee makers obsolete items in the near future. Furthermore, as the new and improved coffee makers offer the same results they are expected to gradually replace the conventional drip coffee makers for most the restaurants. On the basis of price point, the HoReCa drip coffee makers market can be segmented into less than US$100, US$100-200, and more than US$200. The market is likely to grow in the developing regions majorly APAC and MEA region where the rising millennial population is giving rise to café culture as well as simultaneous demand for fast food. On the basis of region, the markets in Asia Pacific and the Middle East and Africa are expected to dominate in terms of value over the forecast period followed by Latin America. A large number of consumer base has been developed in Asia Pacific and the Middle East and Africa for the for the fine dining restaurant and fast food chains where the consumers are spending higher in eating out with family and friends. Asia is expected to become a prominent player by the end of the forecast period with a significant CAGR attributed to increase in per capita consumption in eating out in the region. Growing disposable incomes in the developing economies of APAC and the emerging trend of coffee shops and eating out are also expected to contribute the revenue of the regional market. Furthermore, the consistent demand for traditional coffee-making methods are also expected to work in favor of the regional markets. By the end of 2025, Asia Pacific is expected to account for a share of 23.7% in the overall market. Some of the major companies operating in the global HoReCa drip coffee makers are Bravilor Bonamat B.V., Group SEB, De'Longhi Group, Wilbur Curtis Co., Hamilton Beach Brands Holding Company, Bunn-o-matic Corp, JURA Elektroapparate AG, Crem International AB, BSH Home Appliances Corporation and Animo B.V.
Transparency Market Research offer 8-year forecast for the global HoReCa drip coffee maker market between 2017 and 2025. The global HoReCa drip coffee maker market is expected to register a CAGR of -0.4% during the forecast period. The primary objective of the report is to offer insights about the present product demand scenario in the HoReCa drip coffee maker market. The study demonstrates market dynamics that are expected to influence the current challenges and future status of the global HoReCa drip coffee makers market over the forecast period. This report also offer updates on trends, drivers, restraints, value forecasts, and opportunities for manufacturers operating in the global and regional HoReCa drip coffee maker market. Drip Coffee Maker brews coffee by percolating hot water through a brew basket of coffee grounds. Coffee is captured in a decanter that may be heated by a warming plate. HoReCa drip coffee makers are being manufactured by the various large scale companies with plants, where they are packaged and supplied globally. Majority of players are European based and are supplying the products globally. By HoReCa Type, the drip coffee makers is segmented into quick service restaurants and the full service restaurants. Both the segments are likely to be declining in the forecast period due to the rising consumer preference towards pod coffee makers and the automatic drip coffee makers. The rising consumer tastes and preferences is further posing the market to decline in the forecasted period. On the basis of price point, the HoReCa drip coffee makers market can be segmented into Less than US$ 100, US$ 100-200 and more than US$ 200. The market is likely to grow in the developing regions majorly APAC and MEA region where the rising millennial population is giving preference to café culture as well as simultaneous demand for fast food. The report includes market share of each segment according to the region with analysis towards market trends respectively. A section of the report highlights HoReCa drip coffee makers’ restraints. It also provides a market outlook for 2017–2025 and sets the forecast within the context of the HoReCa drip coffee makers, including the new product developments as well as better product offerings in the global HoReCa drip coffee makers market. This study discusses key trends of the global HoReCa drip coffee makers market, as well as analyses the degree to which drivers and restraints are influencing the global market. In the final section of the report, a competitive landscape has been included to provide report audiences with a dashboard view. Key categories of providers covered in the report are HoReCa drip coffee makers’. Detailed profiles of the providers are also included in the scope of the report to evaluate their long-term and short-term strategies, key offerings and recent developments in the HoReCa drip coffee makers space. Key players in the global HoReCa drip coffee makers market includes Bravilor Bonamat B.V., Group SEB, De'Longhi Group, Wilbur Curtis Co., Hamilton Beach Brands Holding Company, Bunn-o-matic Corp, JURA Elektroapparate AG, Crem International AB, BSH Home Appliances Corporation and Animo B.V.
Also, another key feature of this report is the analysis of all key segments in terms of absolute dollar. This is traditionally overlooked while forecasting the market. The market value and volume is used to identify the potential of the global HoReCa drip coffee makers market.